What kind of ad images work best? To be perfectly honest…there’s no straight way to answer this. The most effective ad images depend on your ad type and your target audience. We will cover different guidelines and recommendations in this section, but our best advice is to try A/B testing when targeting a new niche. Use A/B testing to see which ad images generate more conversions! You can create one ad set and two different ads; use the same text and targeting audience for each ad and only change the ad image featured. After 24 hours or so of testing you should see that one of the ads is clearly outperforming the other; you can then kill the losing ad and focus on scaling the winning ad. Once you know the “ad image style” your audience prefers you could further optimize your ads by featuring that image and use A/B testing on the ad copy. 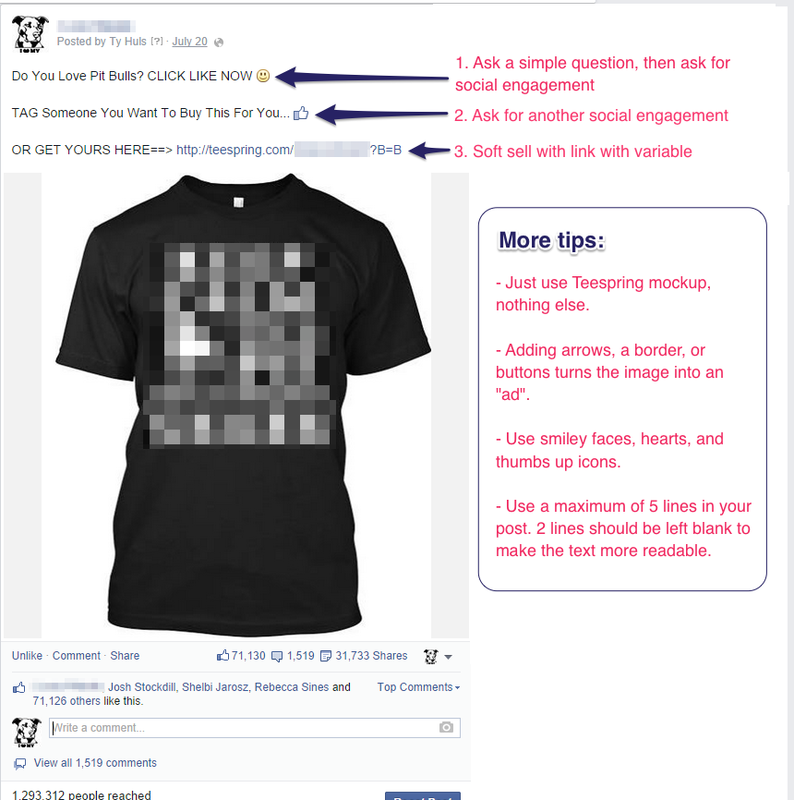 Ad Espresso has some useful tips for creating effective Facebook ads. 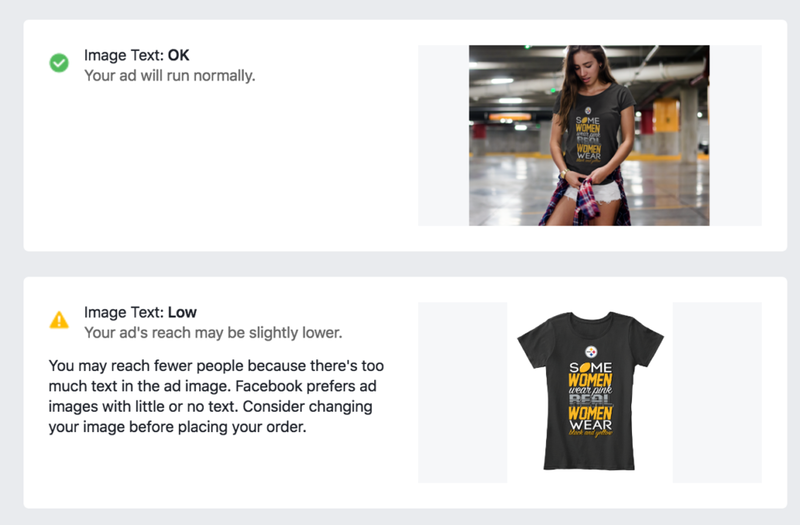 Facebook also has recommendations and examples for each ad objective as well as the recommended sizes for different ad images. Simple ad images usually consist of a close-up of the design. You can add a brightly colored background behind the tee so it stands out. Complex ad images may feature a picture background or a person wearing the product. Remember the design should be the focus of the ad so make sure it’s easy to see (especially on mobile devices). If you notice your ad’s CPMs decrease over a long period of time (i.e. weeks or months) try refreshing your ad image! Canva is a free tool for creating social media images, infographics, etc. ; they’ve even got a Facebook ad template ready to go! You can choose a simple or complex background to feature in your ad and can upload custom images like mockups or call-to-action buttons too. You can also create custom sized images if you’re advertising on different platforms with different image size requirements. AdEspresso has a useful article on how to use Canva for creating ad images here. AdFactory is a popular tool used by many Creators and is specifically designed for creating ad images for Teespring listings. When you add your listing URL product mockups are automatically generated for you to place in your ad image. There is also a variety of quality ad backgrounds, buttons, layouts, etc to choose from. Teespring Mockups are good for selling t-shirts in particular, many top sellers say it’s best to use a simple Teespring mockup with white background (as shown below). Keep in mind this advice is specific to t-shirts, hoodies, etc. For other types of products (like pillows, leggings, etc.) this approach may not work as well. Include a call-to-action and tell your audience what you want them to do, i.e. “Share with friends!”, “tag a friend who would like this shirt”, “buy yours now”. Always make sure the listing URL is accessible (either by clicking on the ad image or a direct link)—use links with GET Variables for better tracking.